This recipe takes about an hour and 15 minutes from start to finish- its worth it! Especially if you are looking for recipes with beets and kale. 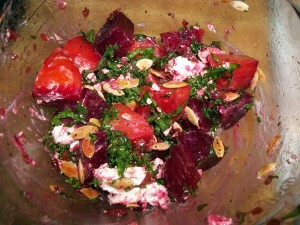 Quarter beets and place in a large bowl. To prepare the cherry vinaigrette drain the cherries and rough chop. Wisk together the vinegars and cherries while slowly drizzling in the olive oil to lightly emulsify. Season to taste with salt and pepper. Set aside. For the Salad toss the warm beets with the cherry vinaigrette. Add the kale, pepitas, crumble cheese and mint. Continue to toss. Season with salt and pepper. Serve immediately.